The Bangor Band regularly rehearsed in the top floor of what is now known as The Isaac Farrar Mansion (166 Union St/ 17 2nd St, Bangor) from the 1920s or early 1930s until the building was purchased by the YWCA in the 1970s. During those years the house was known as Symphony House and was originally a project of the Bangor Symphony and later the site of a music teaching school known as The Northern Conservatory of Music. 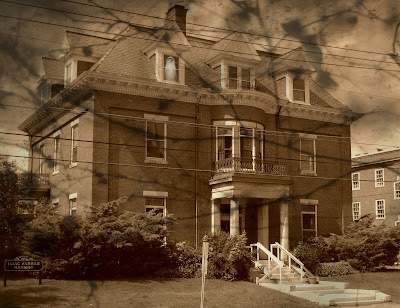 Prior to the Symphony's acquisition of the mansion, the Farrar family had a tragic death on the top floor of the mansion, said to have been their daughter's suicide by hanging. The rooms on the top floor were said to be haunted by her ghost. The rear door and kitchen area were also haunted by a poltergeist of a small boy who would mischievously rattle and rearrange the coat hangers, lamps and chairs in the rear area, with no explanation. As anyone who ever taught lessons up on that top floor knows, when the building became silent in the evening the ghost would make its (her) presence felt not only in the band rehearsal area, but most strongly in the band library, which had been her former bedroom. 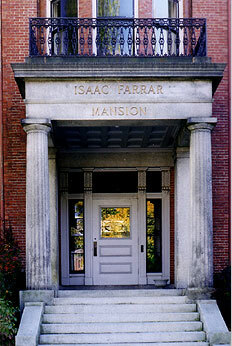 Isaac Farrar Mansion (can you find the ghost}? During the 1980s when I wrote this march I was teaching many a late night on the top floor, and although the band had moved its rehearsals elsewhere by then, the library was still on the top floor and the house was still strongly haunted. I titled the march to honor The Ghost of the Band Room. In 1985 when I was named conductor of the Bangor Band I wanted to write something to honor the history and traditions of the band. I decided on a "march" that wasn't quite a march in form, but borrowed from the march tradition of so many former bandmasters. I chose the style of the first section—a trio-length melody instead of a first strain—with RB Hall and HJ Woods stylistically in mind for the echoic countermelody. The second strain was intended to evoke the busy style of the mid century marches, such as those by EF Goldman. The trio section is intentionally German in style, evoking the melodic arch of the many German marches we had been playing at the time. It is extended by an extra 8 measures beyond the typical trio length to allow for a harmonic reference to the show music tradition of Richard Rogers. The break strain section is the only deliberately descriptive section with an intentionally confuted harmony that climbs the three flights of stairs to arrive at the top floor of the stairs out of breath. The final iterations of the trio contain an obbligato for the woodwinds that I intended to be reminiscent of the Kenneth Alford woodwind obbligato parts. The Euphonium part was written specifically for George Chase, who loved the high-register singing Tenorhorn countermelodies in the German band music. It is probably too high for most players. Collecting all these "scraps of band music tradition" from off the band room floor made me feel that this piece was both traditional and new, and that it was I who was haunting the old, no longer used, band room.